Welcome! I'm super excited to be joining in on the Christmas Festival Blog Hop. If you're coming from City Girl Meets Farmboy, welcome and thanks for stopping by. Be sure to check out Anderson + Grant next! Also, a big thank you to Kendra at Joy in Our Home for hosting! There's no holiday I love decorating more than for Christmas! Besides the tree, Christmas mantles are my jam! We have a very rustic fire place so I try and decorate accordingly with items that will stand out. I love antique mirrors so I started with layering them in the back. I think mantles are all about layering and stacking when you can! I have this little antique frame with an old family photo in it that stays on my mantle year round. 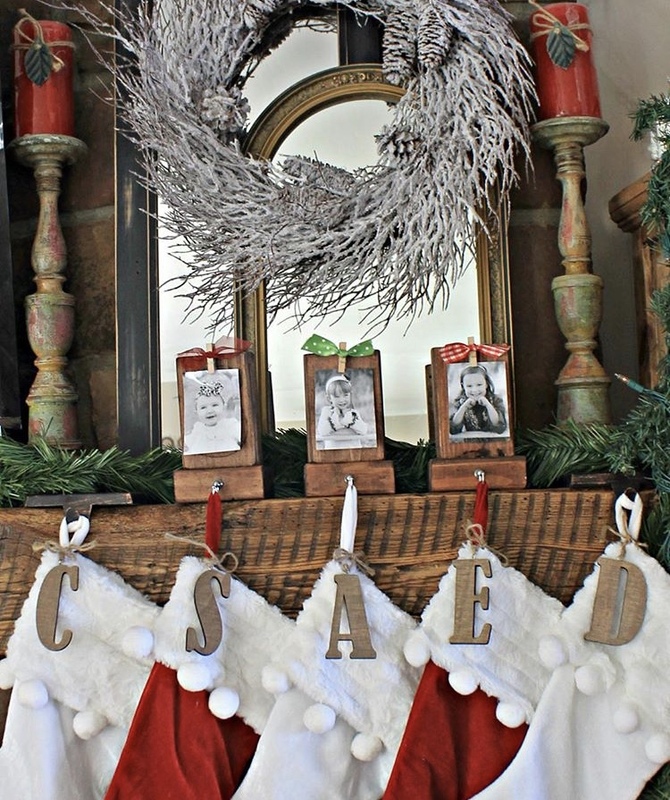 I added this garland spanning across one side of my mantle and draped it down the side. I also had some extra large pinecones I added in a couple spots. I love adding antlers in when I can as well! I love adding old books everywhere in the house. they are a great way to add height when needed. These old candlesticks I found at a flea market last year for $1 each! If you don't want color from the books simply turn them around like I did here to keep it neutral. I usually have my stockings on one holder per stocking but this year I really love them all gathered together to the side on two heavy stocking holders. I found these wood letters at Target and the white and red, pom pom stockings at Walmart. I love classic red and white! Here are some other Christmas mantles I have done in past years for some ideas! Thanks for stopping by today! Be sure to check out all the creative ideas from fellow bloggers below! Have a Merry Christmas!